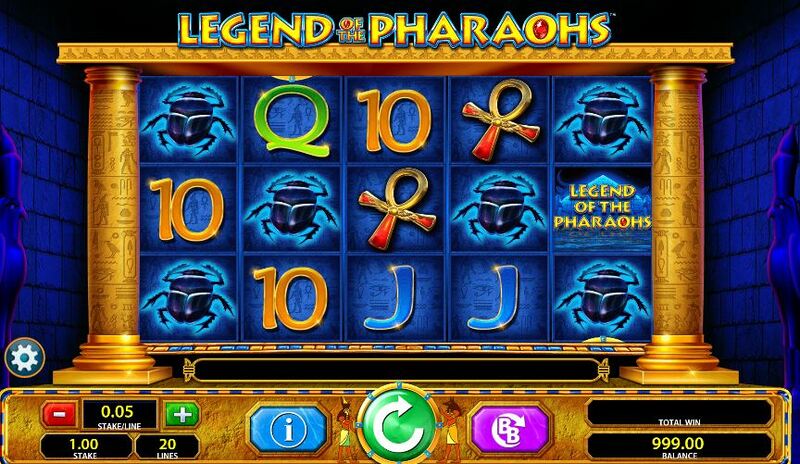 Legend of The Pharaohs slot is another in the Barcrest 'Big Bet' series such as Sheik Your Money and Rainbow Riches Pick'n Mix whereby you can pay ridiculous stakes to make the feature more likely and increase the bonus enhancements of that feature. You know the theme by now; Egyptian music and iconography with the reels set in a temple and a tom-tom drum sound as the reels stop. So how does this Pharaoh treat his subjects? 20 lines and 5 reels of 3 rows each is the usual starter and we have that here. The symbols are single but can appear twice on one reel, the highest being the game's title logo paying 100x bet for 5-of-a-kind, the Ankh 50, Horus 40, Ra 30, the Scarab 20 and the remaining card values 10 down to 4x bet. There are Wilds only on the first 3 reels and if no better win can be formed you will get 10x bet for all 3 in a line. The Blue Pyramids are scatters and 3 or more will trigger the 10 free games with a bonus active, or 2 bonuses for 4 and 3 for all 5 scatters. A red pyramid can appear too which may activate a wheel with lose, cash or the free spins trigger if you land on red, green or blue respectively and in the free spins these appear more offering extras and retriggers. The Big Bet means you can guarantee the more frequent features and the amount of bonuses you get in the free spins. Pay 20x stake and you will get 5 spins and the Blue Pyramids are accumulated over all 5 so you don't need to land 3 at once and you get the standard free games after the 5 have finished. Pay 30x stake and you get the Pharaohs bonus added to the spins. Pay 40x stake and get the Super Pharaoh's Bonus and 50x stake for the Mega Pharaoh's Bonus. If you only collect 2 pyramids during the 5 spins and have paid 30x or more your bet then you get the segment wheel second chance to trigger the spins. Your 3 bonus enhancements will be taken from these 4 - colossal middle reels 3x3 symbols, Wild reel(s) to 3, removal of lower symbols and extra substitute Wild symbol. During the free games you land a Red Pyramid and you will be offered an exchange, i.e. 'continue with 5 spins with colossal Ace' or 'exchange for 9 spins with 10 as an extra Wild'.